On the first of the year, AB-1570 Collectibles: Sale of Autographed Memorabilia went into effect in the state of California, requiring all dealers of any autographed material worth more than five dollars to fill out a certificate of authenticity (COA) specifying date of sale, the dealer's name and street address, and the name and address of the person from whom the autographed item was acquired if the item was not signed in the presence of a dealer. While AB-1570's goals are to prevent the distribution of forged autographs, many booksellers feel they've been swept up by a vague law with onerous requirements and that portions constitute an invasion of privacy, citing possible violations of California's Reader Privacy Act of 2011. AB-1570 is an updated version of a law passed in 1992 that applied to sports memorabilia in an effort to stem the tide of a multi-billion dollar forgery industry. Sponsored by former Assemblywoman Ling-Ling Chang (R-Diamond Bar), the bill received vocal support from actor Mark Hamill, better known to fans as Luke Skywalker of the "Star Wars" films. Hamill had become increasingly frustrated with seeing movie memorabilia for sale with his faked signature. Though Chang later wrote on her Facebook page that booksellers were not the intended targets of the law, she was voted out of office in November, and it's unclear who will take up her cause. "We don't tolerate fake signatures," said California-based bookseller John Howell. "Booksellers don't want forgeries undermining the market. 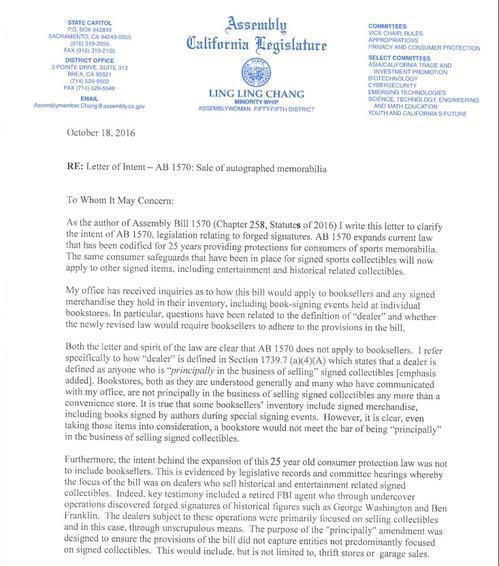 AB-1570 is not needed for us to continue practices already in place that keep fake signatures off the market." Booksellers registered as members of the Antiquarian Booksellers Association of America are bound by ethics regulations to offer full refunds to dissatisfied customers no matter what state they work in. California resident and bookseller Brad Johnson is circulating a petition on Change.org to repeal AB-1570. "The unknowns concerning the law are forcing many booksellers to proceed with an abundance of caution, which generally translates into a decision to no longer offer autographed materials to consumers in California," Johnson said. Kottler signed up for the fair the week after the bill was signed into law, then spent the next three months deciding whether he should stay. "I decided to withdraw from the book fair after I examined the list of items I had at the 2016 fair, and 75 percent was autographed material. I would have brought similar items this year," Kottler explained. Though he could have easily replaced his wares with non-autographed items, Kottler felt the swap wouldn't justify the trip. Still, "I don't need a repeal of the law," he continued. "If the Legislature removes the COA requirement of providing names and addresses of sources, I could live with the rest of it. To me, it's more of an inconvenience." The state has not provided guidelines on how it plans to enforce the law, yet those caught violating AB-1570 are subject to "civil penalties equaling 10 times the actual damages incurred." "There is considerable confusion as to who the law applies to, whether it is retroactive, and so forth," Johnson continued. He also said that California booksellers who initiated the repeal petition are in conversation with "key" members of the California Senate and Assembly. For the moment, out-of-state booksellers are interpreting the law in two ways: Connecticut-based Easton Press deals largely in signed, limited-edition items and will no longer ship books to California, asserting prohibitive COA costs. Kottler, however, is not sure whether the law applies to out-of-state dealers. "I believe I am not bound by AB-1570 if I send a purchased, signed copy from Massachusetts to California, but the law is unclear," he said. Susan Benne of the ABAA says her organization hopes members will educate themselves on the new regulations. "Our goal is to inform our members that this new law is on the books in California, and to make sure they understand how it may impact their businesses," she said. (The ABAA does not provide legal counsel; members are encouraged to seek out California legal representation to understand how the law applies.) "In terms of protecting the consumer, we don't oppose the rationale behind the law, but the way it was written impinges on the privacy of booksellers. And the requirements may be unnecessarily onerous for small businesses."